I recently got it into my head to purchase a Camellia after watching an old black and white Japanese film which featured an absolutely stunning camellia garden. Even though it was in black and white you could tell the petals were a rich, dark red and the yellow stamens were particularly conspicuous. After several weeks of scouring the local garden centres and various text books I was beginning to learn the truth of my folly. 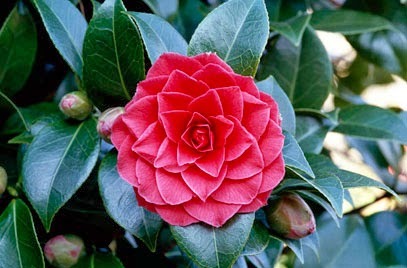 If you want a traditional styled Camellia with the pronounced yellow stamens then red isn't really red. The best you can get is a dark pink and if you do have red it will not be in the traditional 'rose' shape, rather it will be one of those over-blousey pompoms - pompoms is not the technical term! I had given up until I had a glimpse of a photo card of Camellia 'Black Lace', a cultivar not listed in my old Hilliers Manual of Trees and Shrubs. 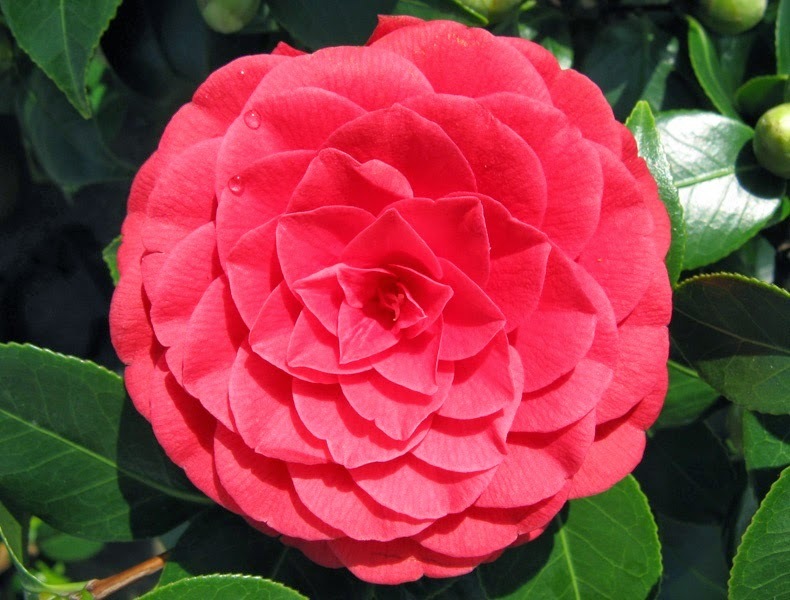 It was indeed a red camellia that wasn't over-blown and while it wasn't the traditional rose shape it was very similar in design to my most favorite of all camellia cultivars - Camellia 'Desire'. Camellia 'Black Lace' an evergreen shrub with a dense upright habit. It produces particularly dark green leaves with act as an excellent foil for the flowers. As compact as it is, it is not a dwarf form and is able to reach up to 10 ft both in height and spread once mature. The formal, double blooms are produced in the early spring either solitary or in clusters. Each one is a deep red and can house around 60 petals. Like the majority of Camellias, Camellia 'Black Lace' is ideal for growing in pots or containers as they have a shallow, fibrous root system. The are best planted at the back of the border for structural effect and provide much needed colour over the winter season. They prefer a moist free-draining soil but more importantly the soils will need to be acidic or at the very least have a neutral pH. They do not like to be grown in shallow soils on chalk, but if in doubt you can always add a decent amount of ericaceous compost to the soil before planting. 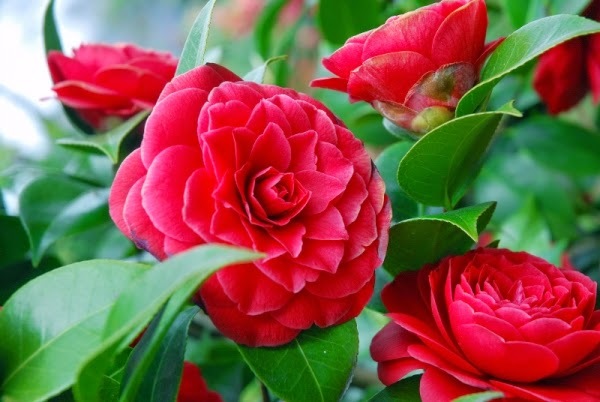 While camellias are perfectly capable of coping with harsh winter weather the flowers are not, so while a sunny south facing position may be best for growth the flowers are more likely to suffer damage. Camellias are best positioned on a sheltered north or east facing wall and sheltered from cold, dry winds and early morning sun. Be aware, particular in northern European climates that damage can occur on the flowers as a result of the effects from early morning sunshine followed by frost. In areas prone to late frosts, avoid planting Camellia 'Black Lace' in a south or west facing site unless there is some light overhead shade from other trees that can offer some protection.